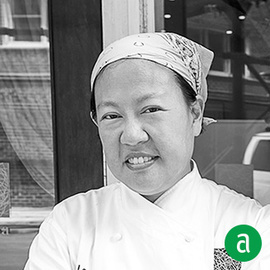 Anita Lo, Owner and Executive Chef of Annisa in New York City, shares her career timeline and advice for up-and-coming professionals. The best advice I received was to taste everything. David Waltuck taught me that. I consider David and Karen Waltuck my restaurant parents. My partner, who started Annisa with me, worked with them as well. They taught me the importance of a good staff meal - How it brings together the front and back of house as a team and as a family and how it shows respect for food, in general, and respect for your employees--all invaluable. My first job was at Bouley. He was farm-to-table way before the trend. I learned the importance of pristine ingredients, handled with care. The food has kept me motivated in tough times related to work. Great food never lets you down. In all bad times, a stellar meal lifts me up. My most memorable externship was when I worked briefly at Michel Rostang and his Bistro D'a Cote in Paris. I just recently made some foie torchon with a langoustine running through the middle, like they had at Rostang, for Christmas gifts. The food, even the staff meals, was very memorable. I had sheep testicles at the bistro, which were fantastic. For staff meal, we had a sac of salmon eggs that one of the Japanese cooks had saved. There was even the rare female cook, on the hot line at Rostang, who was treated as an equal, as far as I could tell. I wish I had known 10 years ago to take better care of my body. This career can be grueling.